PORT-AU-PRINCE, Haiti—Scott Lewis hoped to deliver more than one million meals to Haitians on Wednesday via a 15-truck convoy brimming with beans and rice. Instead, “It was the convoy to nowhere,” Mr. Lewis said. Well after dusk, the 52-year-old founder of a U.S. disaster-relief organization had barely delivered any food, other than some bags left at a missionary hospital, and a few more bags that got looted from the convoy as it crawled along crowded streets. Trucks conked out. Communication with the U.S. military broke down. Traffic snarled the streets. Hungry crowds made handing out food unsafe. It’s not typical for so much to go wrong on a major operation like this—in fact, on Thursday, the Army successfully delivered the cargo, in the largest single-day food distribution here. But a diary of Wednesday’s journey reads like an anthology of the obstacles stifling efforts to deliver aid since an earthquake turned the Haitian capital to rubble two weeks ago. On Thursday, the United Nations’ World Food Program appealed to governments for more cash for Haiti supplies: $800 million to feed two million people through December, more than quadruple the $196 million already pledged. So far, the WFP has delivered about 13 million meals here through partnerships with nongovernmental organizations such as the one run by Mr. Lewis, the Florida-based Eagles Wings Foundation. 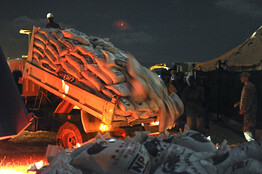 “There have been a few incidents when it was difficult and complicated, but the majority is going out efficiently and without incident,” said Bettina Luescher, a WFP spokeswoman in New York. Mr. Lewis’s plan Wednesday morning seemed simple enough, and he had reason to be confident. His team was well seasoned from responding to brutal hurricanes in southern Florida the past decade. It had already made more than eight food drops over the preceding days, amounting to 2.2 million meals, or more than 20% of the WFP total as of Wednesday. He had Mr. Minyard, the former Army Ranger, leading his 15-truck convoy. He had a unit from the 82nd U.S. Airborne providing security. He’d also hired 150 Haitians from a nearby missionary school, as well as a team of Haitian security personnel, to help do the work of loading and unloading the 150 or so tons of food. It was supposed to be a proud and symbolic step in this city’s recovery. Mr. Lewis’s organization put out a news release that morning, trumpeting the effort. “This is about Haitians helping Haitians,” Mr. Lewis said early Wednesday as the convoy got under way. The goal for the day: Mr. Lewis’s 15 smaller trucks would meet at a warehouse to pick up about 65 tons of bulk food, and then meet up with five larger WFP trucks to get still more food. Then, his smaller and more maneuverable trucks would distribute the food at a site to be determined during the day. It was imperative that all this happen during daylight hours, out of concerns for security. Even during daytime, some food drops in recent days had turned violent. In one case earlier this week, U.N. troops providing security for the group had squeezed off several rounds from their 50-caliber guns over the horde of desperate Haitians fighting for food. Peter van Agtmael/Magnum for The Wall Street Journal People are turned away from an industrial park, where a traffic jam bottled up aid trucks. “This is never easy,” Mr. Minyard said. He sat in the lead vehicle, a blue Isuzu dump truck loaded with bags of rice. Things got off to a good start. The team dropped off some bags at a missionary hospital near the airport, then unloaded a small shipment at a quake-damaged church that’s now home to about 100 displaced Haitians. “God bless you for serving our country,” the pastor, Guy Thomas, 45, said to Mr. Minyard. Trouble began when Mr. Minyard headed to a warehouse for one planned rendezvous. Though the warehouse was just a short drive from the airport, impenetrable traffic immediately engulfed the convoy. The trucks sat, barely inching forward, for nearly two hours. The problem became apparent: The warehouse gate—enshrouded in a cacophony of noise, wild dogs, pigs and exhaust—was closed to all traffic. A line of trucks as far as the eye could see converged on the gates. Someone else’s truck (not one of Mr. Lewis’s) had broken down earlier that morning inside the complex, blocking all traffic into and out of the warehouse area. The simple snafu was preventing hundreds of trucks from getting on with their business. “Welcome to Haiti, man!” shouted Jason Cassis, 27, owner of two of the warehouses inside the complex, over the din. The truck breakdown was no small matter, he said. Nearly the only business now happening in Port-au-Prince takes place at this complex of more than 40 warehouses. It’s also a key part of the relief effort, since it stores so much food. Mr. Minyard, sitting on the ledge of his truck’s window, signaled with his arm for his convoy to pull out. It was now slightly past midday. The team needed a Plan B. Just then, fortuitously, another convoy of WFP trucks swung into view. “Fall in, fall in!” Mr. Minyard commanded over his radio, instructing his convoy to join the passing WFP trucks. Peter van Agtmael/Magnum Photos for The Wall Street Journal Truckloads of rice are unpacked after failure to deliver them. Mr. Lewis’s convoy made its way back on to the main road. It still needed a destination where the workers could safely transfer the food from the big trucks into the smaller ones. Doing it in an unprotected area could lead to pandemonium. Earlier in the week, one of the trucks blew a tire during another mission, bringing the convoy to a halt. Within seconds, locals swarmed over one of the trucks, picking it clean of its two tons of food. So Mr. Minyard’s convoy headed to a fenced-off police facility at the port. His convoy reached the entrance, and waited outside for further instructions. An hour passed, then another. Across the street, Haitians scrounged for anything they could find in a vast market of rotting vegetables, which emitted a powerful stench made stronger by the heat. Mr. Lewis spoke at length with the U.N. troops guarding the complex, explaining he had authorization to use the site to transfer the food. Still, access was denied. The grounds needed to be kept clear for the Haitian president’s helicopter, though that couldn’t be confirmed. Finally, Mr. Lewis stormed back into his vehicle with new instructions: Go back to the airport, where thousands of troops from the U.S. 82nd Airborne had set up camp. The team would transfer the food to the smaller trucks there, then move out to distribute it. “You can’t do this job without being flexible,” Mr. Minyard said. The clock ticked toward 3 p.m. He was still optimistic the job could be done before sundown. When the convoy reached the airport, a man naked from the waist down, with his arms held behind his back in plastic handcuffs, pranced around the entrance. “I not feeling too good!” he shouted in English. 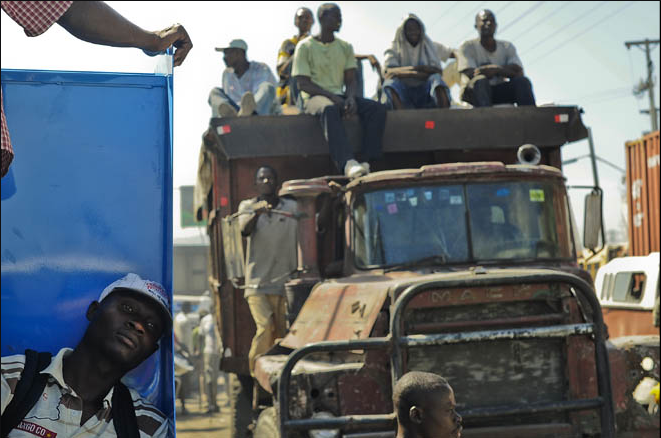 Finally, at 3:41 p.m., the team of 150 Haitians began loading the food into the smaller trucks. It was their first work of the day. About 30 minutes later, the loaded small trucks were ready to roll. Several of the soldiers with the U.S. 82nd Airborne said they’d be eager to help. Maj. Brady Sexton, 37, approached and said if the convoy gave his men half of one of the trucks to unload at their Army locations, they would provide security for the entire food drop. In light of that offer, Mr. Lewis went and found the Brazilian U.N. troops who had provided security on previous days, and told them they wouldn’t be needed. But the trucks didn’t move. They sat for another hour. Word came that the U.S. military needed clearance for the mission. The sun dropped low on the horizon. Some members of the group began wondering if they’d get the food out after all. When that reality became clear, Mr. Lewis and other members of the team erupted in rage. But the day wasn’t over yet. The food-laden trucks couldn’t stay at the airport. The Army told Mr. Lewis to take them to the soccer stadium, where more U.S. troops were based and where the food could be stored overnight. 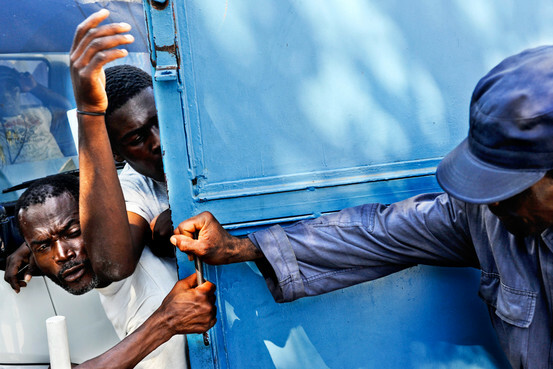 A military official in Port-au-Prince didn’t respond to an email seeking comment. However, it’s too dangerous to distribute food in the darkness, when crowd control can be especially difficult. The plan was simply to store the food in the stadium for distribution the next day. The stadium’s proprietor was having none of that. “No one called me about this,” said the man, who gave his name only as Contance. There were 700 people living in the stadium at the moment, he explained, and a food drop at that hour would create mayhem. Once again, the convoy started up its engines to look for a safe place to store its cargo for the night. The next try: the presidential palace. Along pitch-dark streets, the only visible light came from campfires. From the rear of the convoy, Mr. Lewis’s voice crackled across the radio: “We’ve got trouble back here.” About 40 Haitians had jumped his slow-moving truck peeling off numerous bags of food. During a brief stop at the presidential palace around 7:30 in the evening, Mr. Lewis received an email from U.S. Col. Christopher Gibson, telling him how he’d like to meet the next day to better synchronize the operation. “Do you have any idea what just happened in your sector?? ?” Mr. Lewis emailed back. Finally, Mr. Lewis’s convoy went back to the only place it knew it could safely drop the food for the night: the airport.